A mass rally in defence of national minorities’ education and against the nationalistic and discriminatory policy of the current Vilnius authorities will take place on Thursday, 17th March. The rally organisers: the Parents’ Forum at Polish Schools in Lithuania, Committee for the Defence of National Minorities’ Schools, and the Strikes Committees of National Minorities’ Schools invite everybody to gather in front of the Vilnius City Local Government seat at 3 p.m. The rally is another attempt to bring attention to the urgent problems in the field of national minorities’ education. One of the issues that must be addressed is the delay in the accreditation of the Władysław Syrokomla Secondary School in Vilnius, the biggest school with Polish as a language of instruction, in which more than 850 students learn. It is also one of the best Polish schools in the Vilnius region, which makes it possible to more than 80% of the pupils to be admitted to universities yearly. The school on its part has accomplished all formalities concerning the preparation for the accreditation, but it has not received any proposal from the Ministry of Education and Science after the ministerial committee’s visit. Parents and the school community are standing out also against the Vilnius government idea of Joachim Lelewel Secondary School relocation from the building of the famous “Piątka” [trans. School No. 5] in Antakalnis to a building at Minties Street on the other side of Neris. According to the governmental school network optimisation plan, educational institutions are to be located evenly on the Vilnius map, but the Lelewel School relocation means that on this side of Neris there will not be any school with Polish as a language of instruction, whereas on the other side the overconcentration of them will take place. Currently, students from 249 streets attend the school, along with pupils from outside Antakalnis who commute to it. The school communities are going to protest also against the attempts to close the existing Polish and Russian schools down (the Szymon Konarski School, School in Lazdynai, Lew Karsawin School, Alexander Pushkin School, School “Ateities,” School “Centro,” School in Liepkalnis, School “Saulėtekio,” School “Senamiesčio,” School-Kindergarten “Saulutė,” School-Kindergarten “Svaja,” Schhol-Kindergarten “Berželis”). 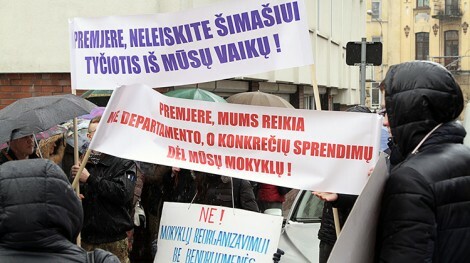 The rally organisers are opposing also against occurrences of corruption of the liberal-conservative coalition in the local government of Vilnius when it comes to the case of funneling about €6 million to private bank accounts of private kindergartens’ owners, incidents of political corruption, as well as documents forgery when holding competitions for the official’s position. “We will firmly demand the accreditation of all national minorities’ schools in Vilnius and maintenance of the existing primary schools and kindergartens!” – it is written in the declaration of the rally organisers.